For the last 2 days we have had an American visitor. Unfortunately, it was the tail end of the “Storm of the Century” Jonas. 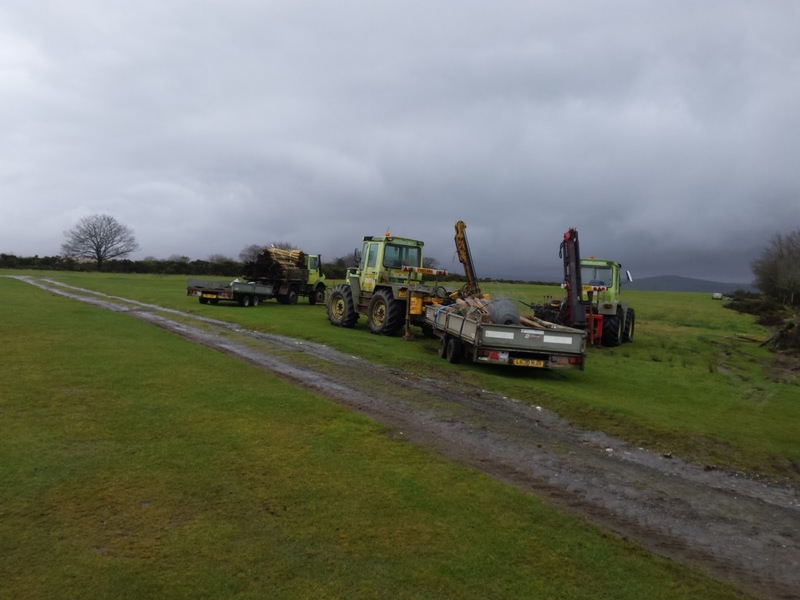 Although not living up to the forecast doom and gloom, the 2 days of torrential rain has left the airfield as wet as it’s every been forcing us to find other tasks to occupy us. 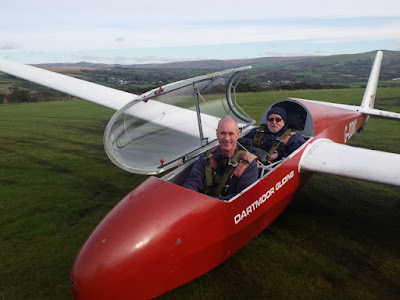 Lucky Jorge Beasley managed to spend the day with CFI Don getting a lot of his ground schooling and preparation for the Bronze “C” exam completed. 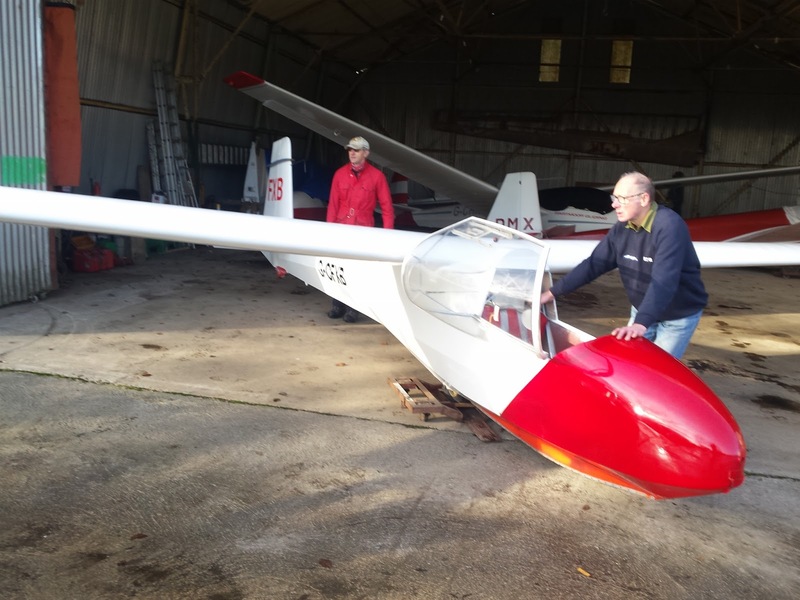 Colin Boyd finished the minor adjustments to the K8 tailplane and elevator including painting to couple of patches of bare wood. The aircraft should be ready to fly again on Saturday. 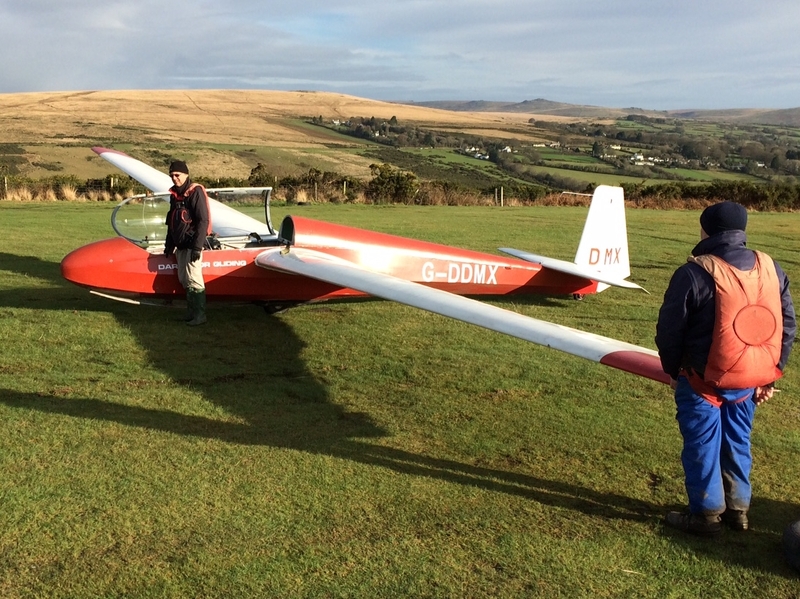 The other item of interest today was the presence on the airfield of a team of fencing contractors. More details about this in next Saturday’s blog. 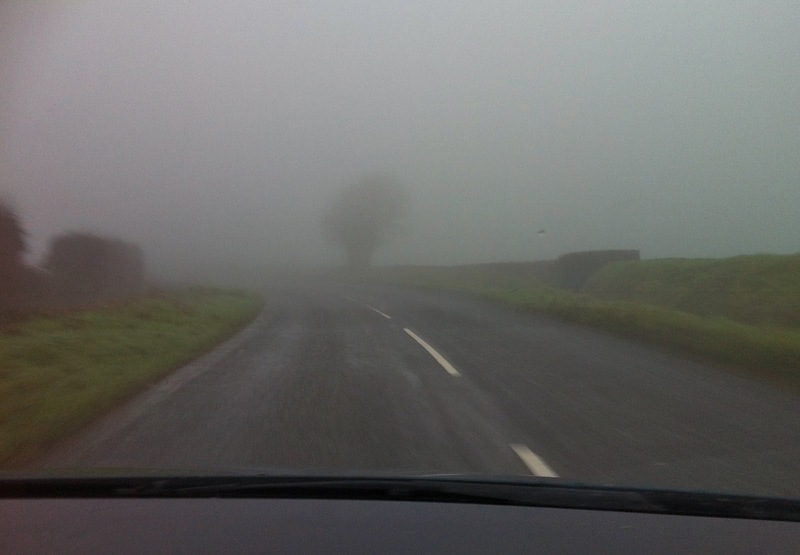 We’ve had torrential rain, gale force winds and a tiny bit of frozen this winter, so at least today’s reason for not flying added a little variety – yes, fog! 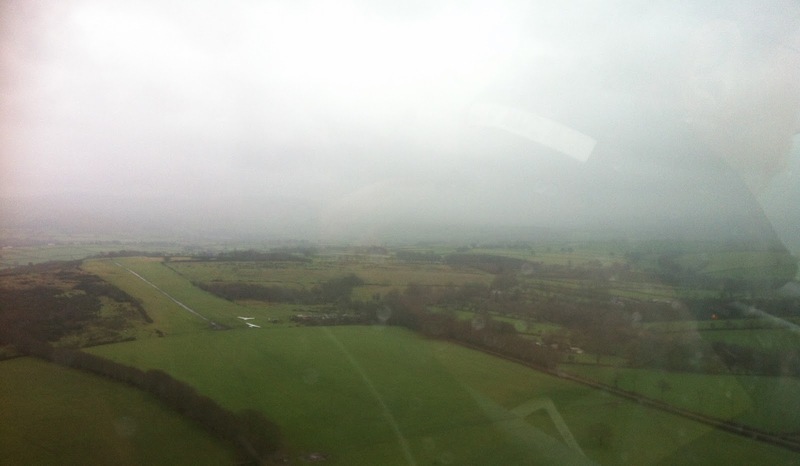 As you can see from the photo, conditions were definitely not VMC, and remained so throughout the day. Approaching the club: definitely not VMC! But that didn’t prevent members from attending to get those annoying little jobs done or progress their ground school briefings, which is exactly what Roger Appleboom and Ed Borlase did, Roger addressing the non-operating light in the Gents (the pull on-off switch is broken) whilst Ed worked his way through the ground exercises on the front of the ab initio card. A little later Colin Boyd appeared to inspect the rigging pins on the elevator of the loaned K-8. This revealed a couple of additional defects requiring one half of the elevator to be parted from its mate and taken to Colin’s house for remedial attention and convalescence (see photo). Colin Boyd and Roger Appleboom inspecting the elevator of the K-8 in the clubhouse. 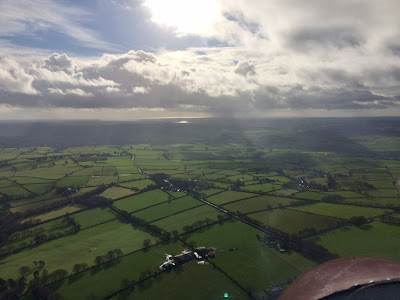 Typically, just as we were departing mid-afternoon the cloud began to lift and, by 4:30pm there was the occasional blue patch of sky, although the moisture in the air continued to some generate some very low orographic cloud over the moor. What’s going to stop us from flying next? A plague of toads..? The weather threw everything at us today. Early flying was stopped by low cloud and mist. This gave way to a period of very strong, very strong SE winds which was followed up by torrential rain by mid afternoon. But showing the resilience of the granite which underpins Dartmoor, the members just got on with their various self appointed tasks. Rick, Mike and David were working away on the Guslaunch winch which ended the day with both cylinder heads removed ready for the required new gaskets. Ged spent the day quietly in the clubhouse working on the paperwork for the Twin Astir. 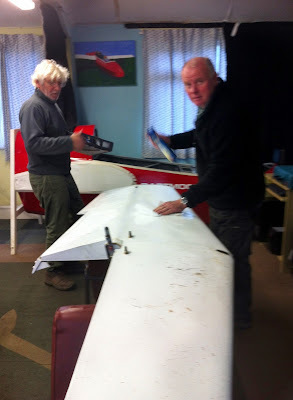 He has been checking the compliance with all the Airworthiness Directives for this aircraft of which there are dozens. He seemed to make good progress. Mike Jardine spent the day “fettling” his Astir. The only question was where was his syndicate partner? A change in the weather today was bound to generate plenty of excitement at the airfield. It was dry, cold and the wind was forecast to be from the SE. 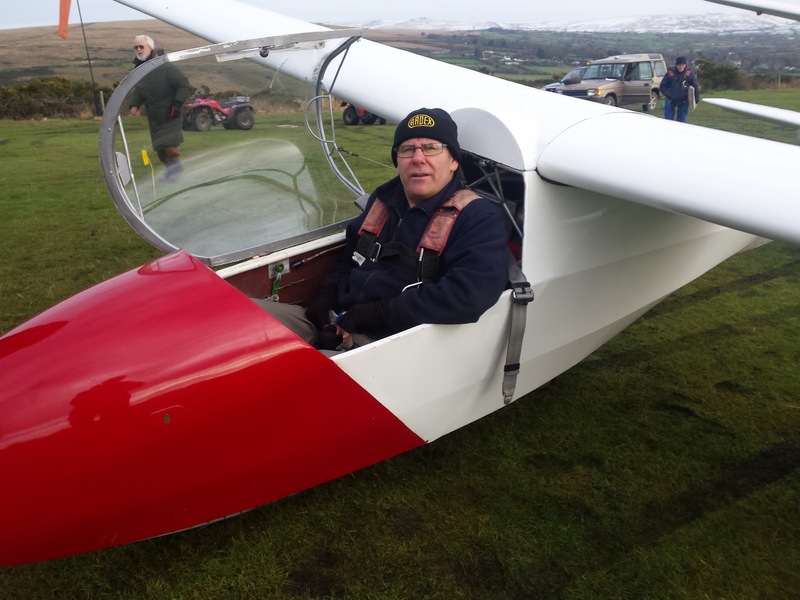 Regular readers will know that, at Dartmoor Gliding, any wind with east in it brings with it the chance of lee wave. Arriving at the airfield, there was already plenty of activity. Unfortunately in their hurry, K13 G-CHXP had it’s main wheel tyre valve torn out, making the aircraft un-serviceable. Jorg and Dave set about changing out the damaged inner tube. Normally this would take about half an hour. Yes, I know that an F! car gets 4 new wheels in under 3 seconds. But due to a comedy of errors / unfortunate coincidences, which would have served well as the basis of a script for Charlie Chaplin, it was nearly 2 hours before the aircraft was ready to fly. 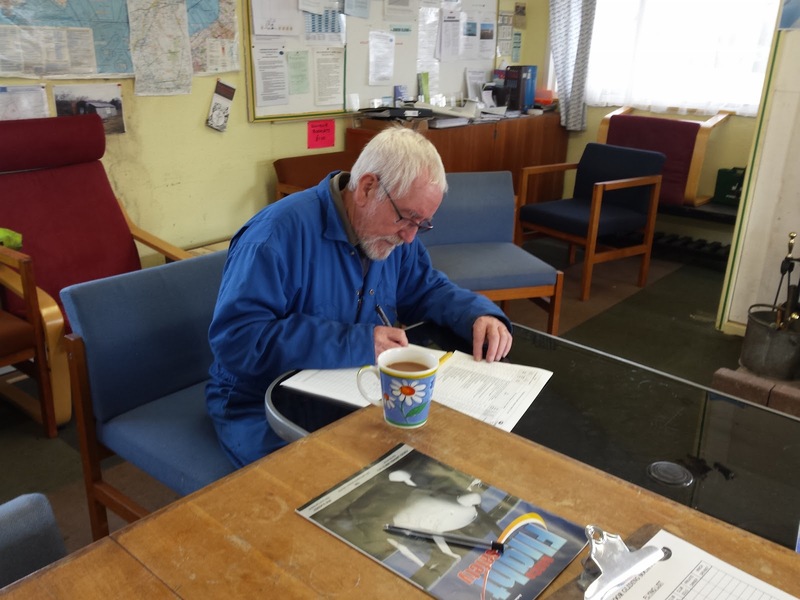 Meanwhile, flying continued with a mixture of check flights, Instructor and pre-solo training. Was there wave? Well no. 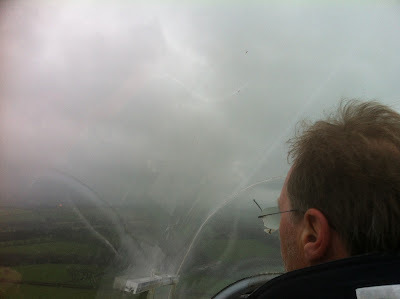 There were all the signs, lots of rotor turbulence, cloud appearing and disappearing, areas of heavy sinking air and a few challenging approaches, but no smooth wave lift. Looking at the temperature profiles this could have been predicted. The wind speed was not increasing with height. 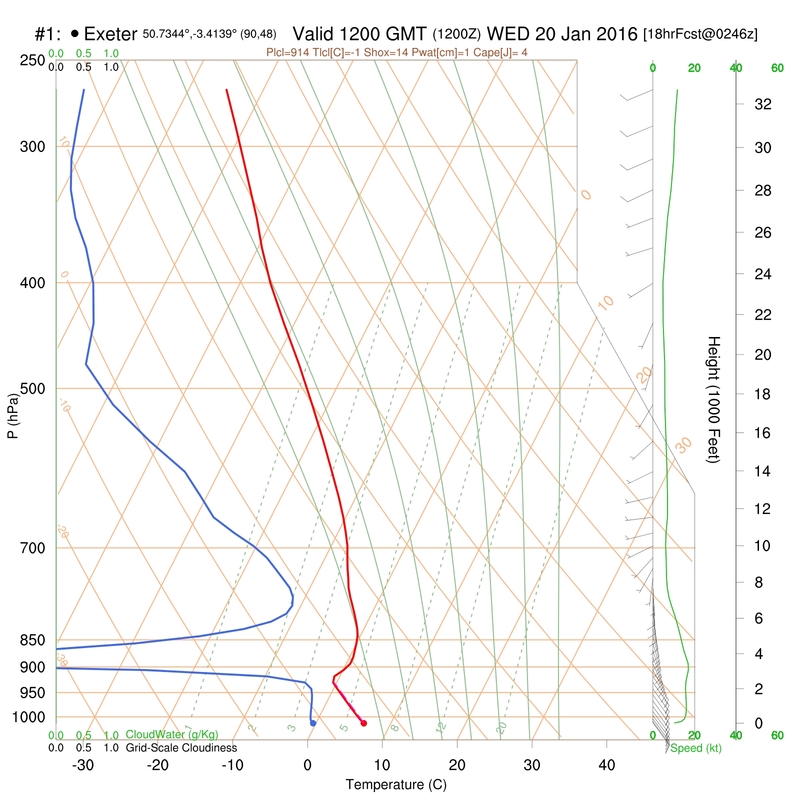 The inversion was a bit higher than would be best but other wise the airmass looked stable. 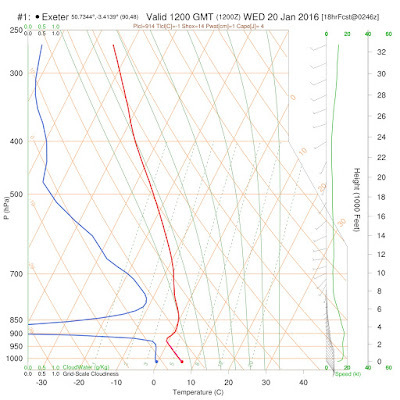 The wind direction above the inversion reversed 180 degrees to become westerly!! Better luck next time chaps, but the practice in the rotors will stand you in good stead. We welcomed visitors Eric Underwood and his wife. They had arrived just to find out where we were but as conditions were flyable and Eric had brought his voucher with him he enjoyed a couple of flights with instructor Ged Nevisky. Eric is ready for his air experience flight picture here with his wife. It remained cold all day with every one wrapped up in their own brand of cold weather clothing. By early evening we had completed 31 flights, not a bad total but lowered a bit by the late arrival of HXP. 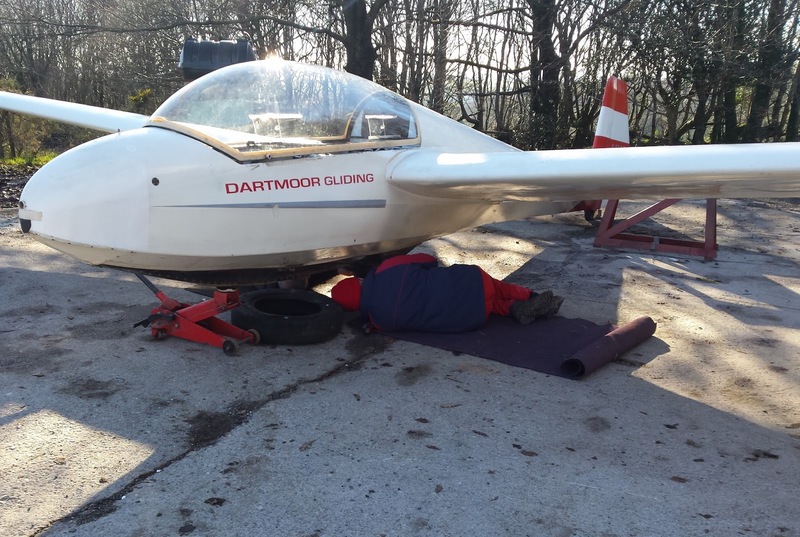 Thanks today to all who helped out as ground crew and to Jorg and Dave for the marathon wheel change. With a complex whorl of fronts on the Met Office chart, rain predicted from 3pm and the wind forecast to be from the SE, there was everything to play for today, and so, what with changing ends and dismantling the hurdle fence, getting the first launch away by 1020 was quite an achievement. 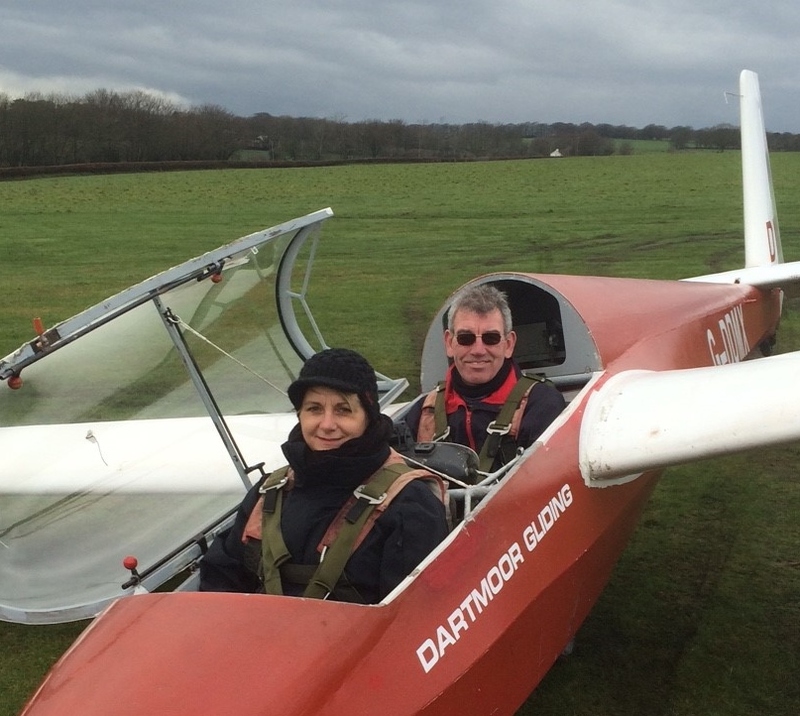 Ex ATC-gliding instructor Jayne Marsh prepares to aviate with Martin Cropper. We were joined by returning temporary members Jayne Marsh and her partner Dave: Jayne (see photo), an ex-ATC gliding instructor from Upavon (and who also happens to be Paula Howarth’s boss) and Dave are prospective full flying members, and very welcome they will be. Does Pete Harvey face the final curtain? An impenetrable curtain of rain signals the end of play mid afternoon. Now it is accepted as ‘bad form’ to apologise, but today there were quite a number of people who put in the effort without receiving the reward and to those who didn’t manage to fly (you know who you are) we offer an unreserved ‘sorry’. 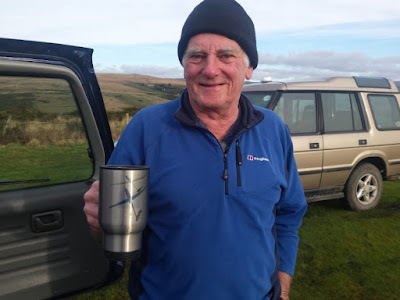 Still, 15 launches in 3 hours on a muddy pitch is not all that bad and, with high pressure set to build over the next few days (and the wind returning to the SE), the portents for Wednesday look good. Today was definitely looked like a flying day. The forecast was for dry, cold weather with very, light variable breezes. De-icing the car to go to the airfield confirmed the temperature forecast. 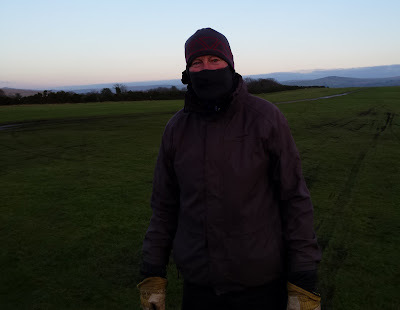 In fact it was 3 deg C. Just a well I had packed my cold weather gear. The airfield was full of activity with everyone busy getting all the equipment ready, aircraft to the launchpoint etc. 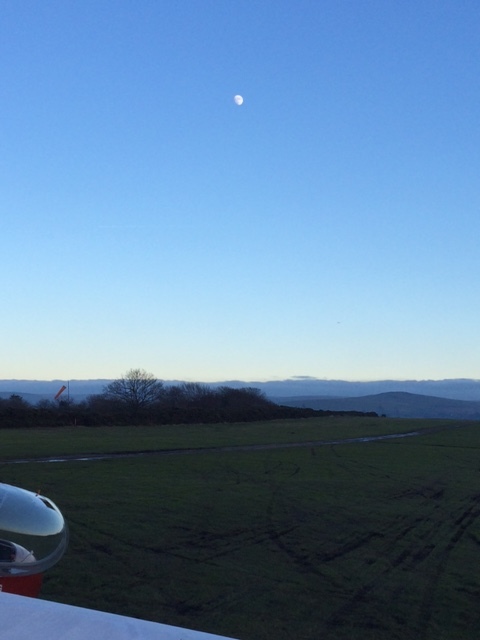 It was decided not to move the launchpoint vehicle from the west to east end to limit any damage to the airfield. The Gold Discovery would serve as today's launchpoint and all aircraft towing would be by quad bike only to help preserve the runway surface. Once the canopies had stopped misting up, CFI Don Puttock and instructor Ged Nevisky. lost no time getting the K13's into the air with a dizzying mix of check flights, instructor training ans ab-initio training. Is there room for me and my cold weather clothing in a K8? 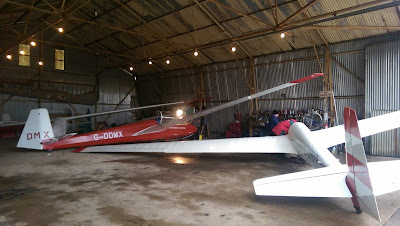 Meanwhile, Mike Gadd and I went back to the hangar to get the "new" K8 G-CFXB to integrate it into club use. 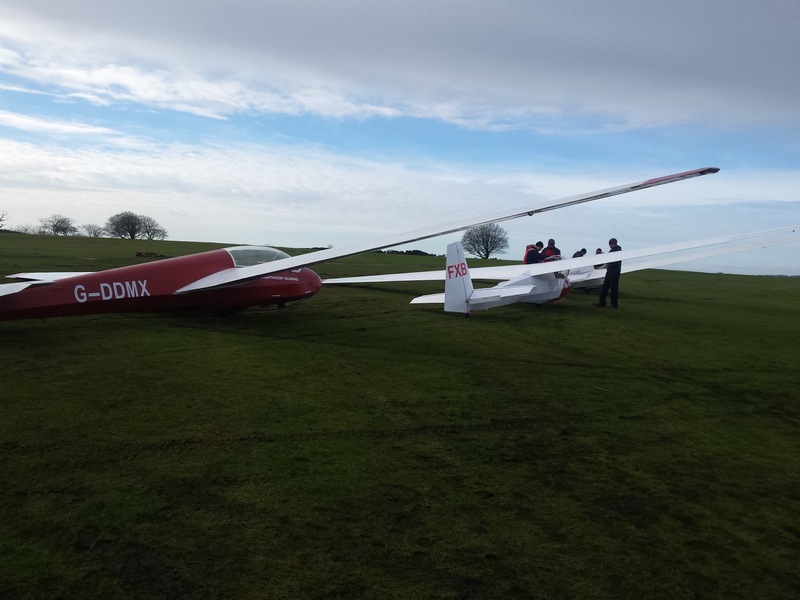 After a successful test flight by me FXB was released into club service and several members tried out it's handling qualities. The happiest of all the members flying the K8 today was Simon Collier who converted to single seater flying today. I think his smile says it all. 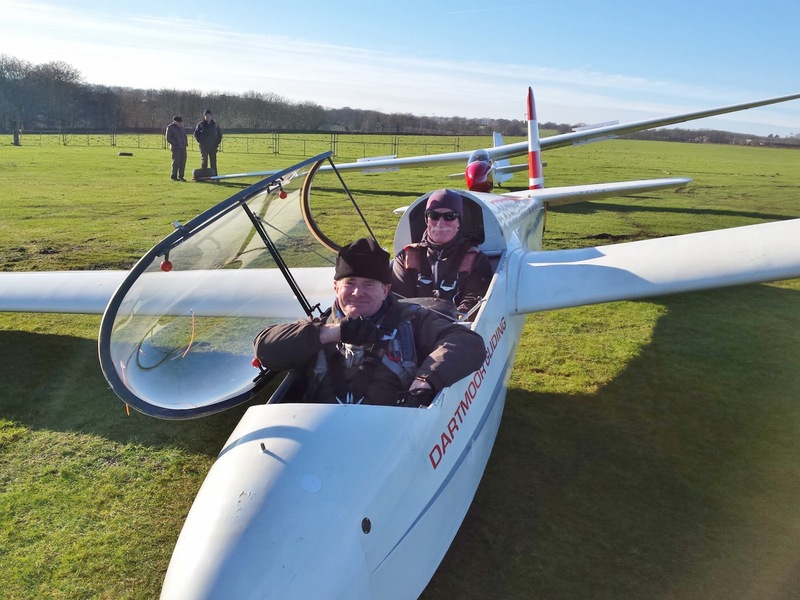 Flying continued until just before dark when canopy mist became an issue so the fleet was returned to the hangar after a good wash. Today we achieved 38 launches; a very good total for a winter's day. The day was not over though. 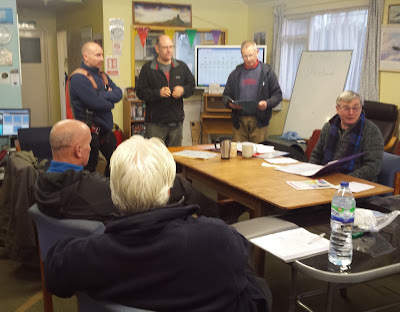 As the members drifted away the Committee held a meeting which lasted well into the evening. There was a break in the weather with a clear sky. 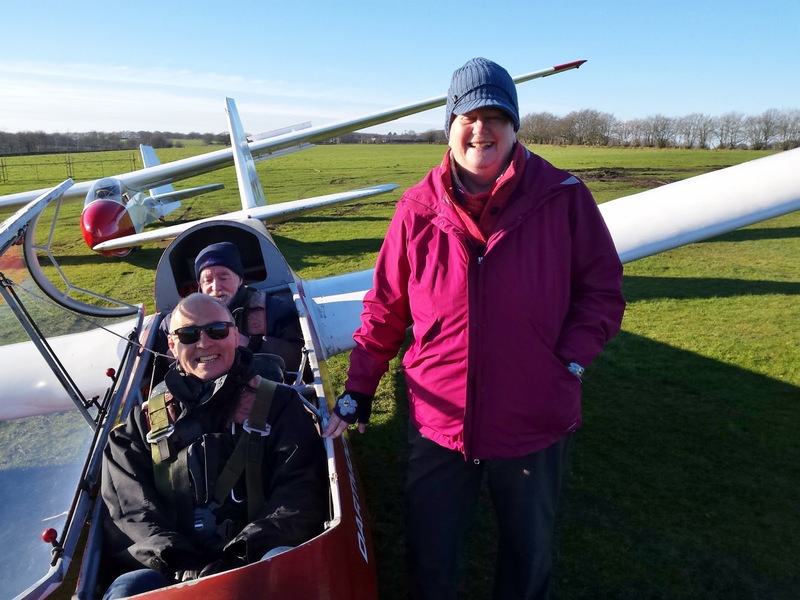 Off went the day’s optimists for some flying in what started as a promising day. What a hardy bunch. 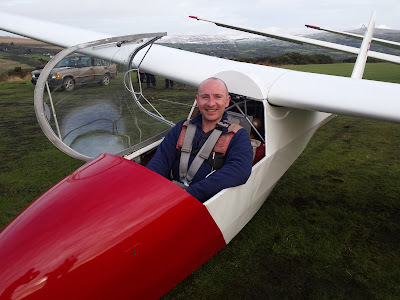 The forecast was for a change in conditions in the afternoon with rain predicted so we hurried as much possible and the first launch was away at 11 am with Stephen Fletcher taking to the air with Ged. 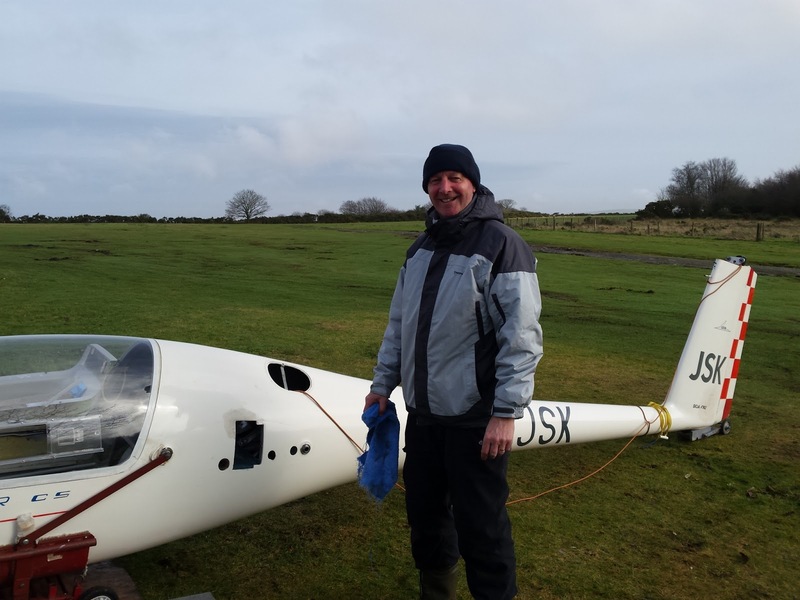 Currency and training flights kept Ged busy through the morning and an opportunity taken for IFP rear seat practice by Steve Raine. 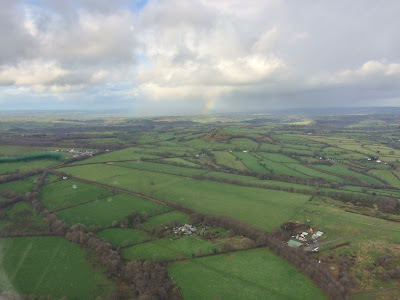 Everyone managed to get into the air before the heavy afternoon rain came as predicted around 3pm scattering a number of rainbows across the moors. 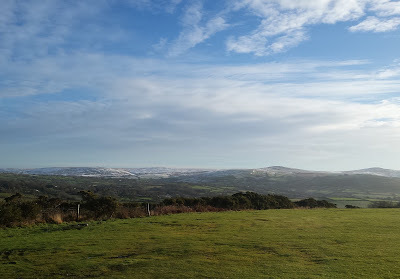 The view south towards Plymouth. 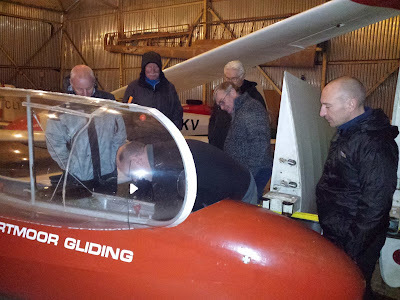 When the rained passed through the day finished with a hangar flight by Allan Holland and the glider was then washed and put away ready for its next outing. The showers were easily visible from the air. Thanks to Scratch and Steve for the winching. After three of us had made a thorough check if the east end, where rainwater was lying in pools along the tracks of last Wednesday's launches and landings, we decided that, once again, it was best to call it a rest day for the airfield, since any further movements would have had a ruinous effect on the surface. Returning to the clubhouse we were greeted by CFI Don Puttock with a wry grin: "Well, we'd best get on with some Instructor training!" he gleefully announced. And so, with trainee instructors Roger Appleboom, Adrian Irwin and putative instructor Richard Roberts they began their voyage through the new set of exercises that has been produced by the BGA. Meanwhile, in a manner as slickly efficient as the inmates of Stalag Luft XVIII moved the stove in The Great Escape, Pete Harvey suggested we should 'go outside', for the weather was, initially, quite pleasant (until the showers built up again). 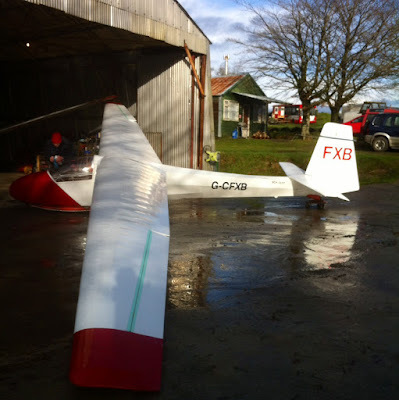 Looking inside the hangar we spotted newly loaned glider FXB, Bob Sansom's K-8, appearing to cry out for attention. And so we brought it into the sunshine to give it it's first full set of DGS Monthly Maintenance: oil, water, rub down, vacuum and polish of the canopy all appearing to be gratefully received. 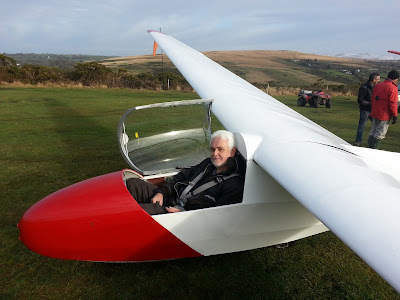 Pete even went so far as to replace the yaw string (see photo) - well, it had been stuck on with an Elastoplast..! as part of its monthly maintenance. Wash'n'brush up completed we returned to the clubhouse to join in the fun with Don and the boys - the new syllabus really is very comprehensive and will need a lot of concentrated effort for our new instructors to get through whilst Don is available to coach and mentor. It also provided a good stimulus for discussion on what, or rather how much, each of the differing levels of visitors/trainees need to know. 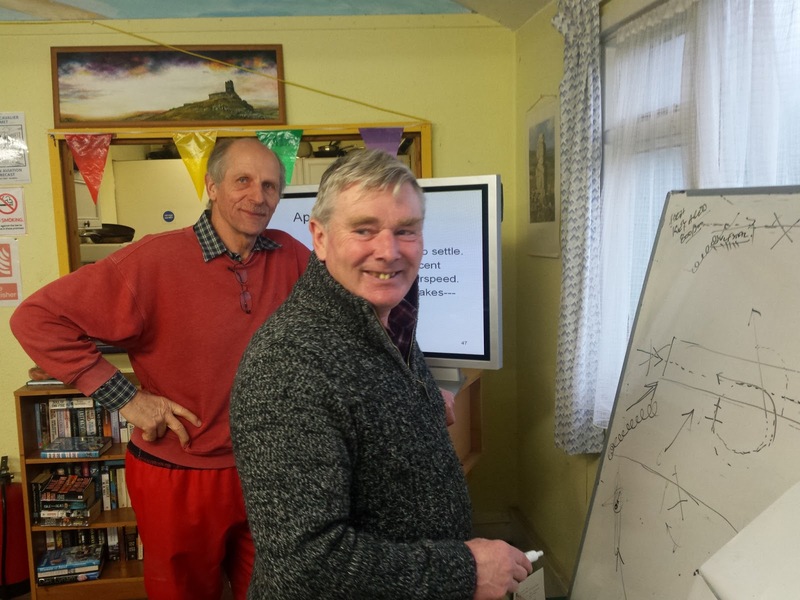 The instructor training continued all day. CFI Don Puttock was on site with the intention of progressing the training of our potential new instructors and IFP's which he did with ruthless efficiency until his charges could absorb no more. Much progress was made. The airfield is so wet. 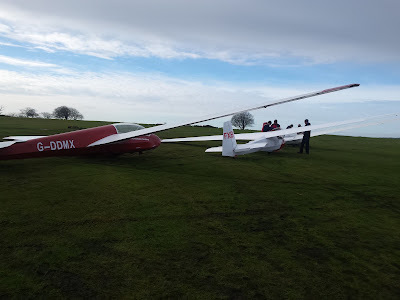 Perhaps the promised cold snap will freeze the ground to make it flyable. There was a possible gap in the weather. Would the runway be usable given the record wet weather? 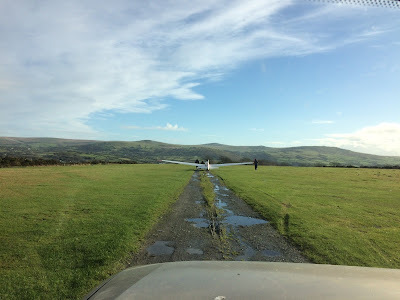 During an early “pitch inspection” it was decided that if we used just 1 aircraft towed only by the quad bikes and landed as close to the track as possible then it might just be ok. The launchpoint was left at the far end where it has been for the last month or so. Moving it would have caused too much damage. 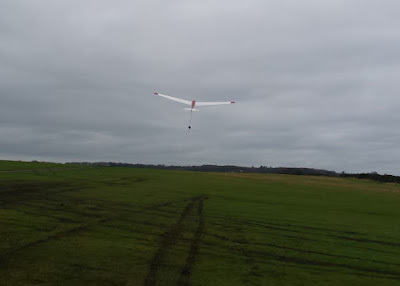 We have a procedure for this and any one of the airfield vehicles can be used as a temporary launchpoint using their own radios and the netbook for flight logging. after a long absence due to his naval duties. 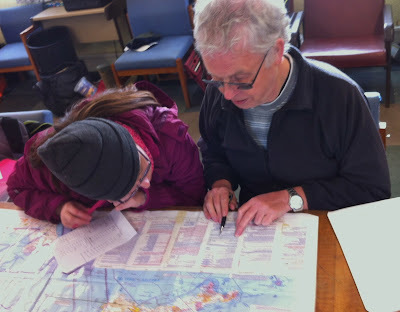 Everyone was out of currency so the day was spent with check flights and re-solos with the instructional duties shared between Don and Ged. The next weather front was expected by late afternoon and in this respect the forecast was accurate. The cloud gradually got darker, and the light, variable wind strengthened from the south until 3.45 when it was obvious that drizzle/rain was imminent. 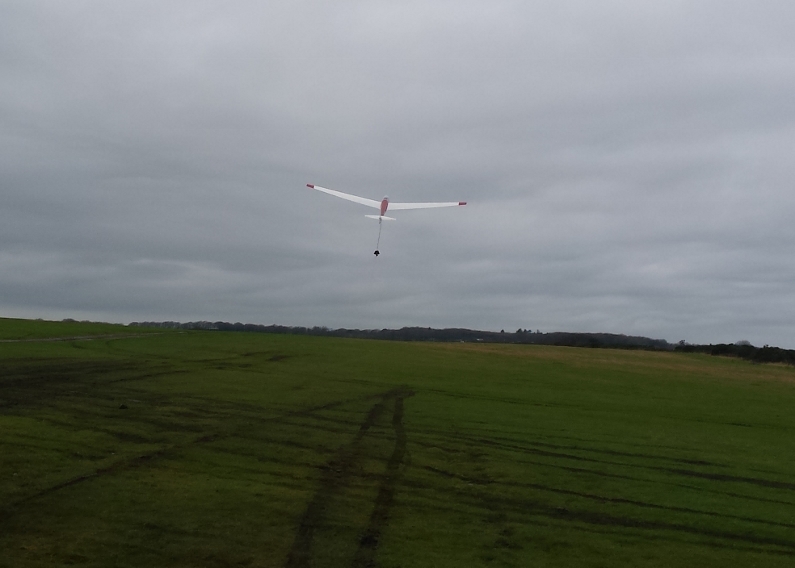 The final flight was a low release ( 250 feet?) to hanger land while the assemble members scrambled to get everything washed and put away before the serious rain arrived. And who got a new gliding mug for Christmas? As we drove through Tavistock, the water erupting vertically from the manhole covers made it obvious that this first Sunday of 2016 was not going to be a flyable. And so we settled on this year's must have for the upwardly aspiring solo pilot or instructor: a pass in the Bronze 'C' Examination. With the threshold set at 70% for ordinary mortals, and 80% for instructors, and with one section containing only 5 questions (ie. more than one mistake equals failure overall) it is important to be confident of success prior to putting oneself forward for this exam. And so, over the course of the morning, we debated various questions in a teach-in manner, which certainly blew away the seasonal cobwebs and got us thinking about some of the more important factors about this sport of ours. We were not complete nerds, however, for various visitors, such as Allan Holland, and Pete Harvey (accompanied by wife Jules) broke the routine. Pete's intervention was most welcome, in that he was able to inform us that the weather in Antigua was eminently soarable throughout the Christmas period (if only you could find a glider capable of operating from water) and that the entire Caribbean was 'benign' – thanks, Pete..! 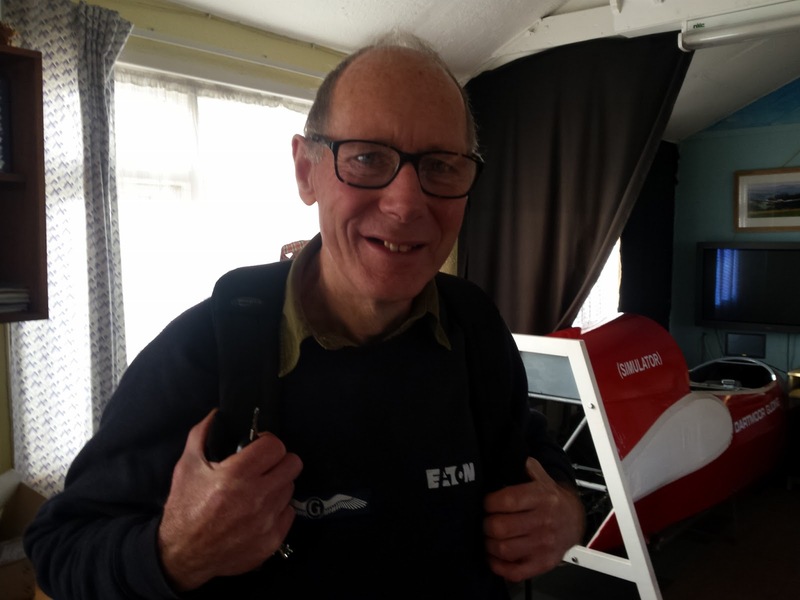 He also informed us that syndicate partner Chris Owen had not returned with them to the UK because he (just had to) make up a vacant space in a skiing party to Italy and contrary to expectations there was a lot of snow. The wet weather continues. 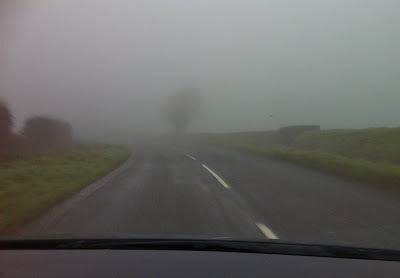 Today just low cloud and drizzle. 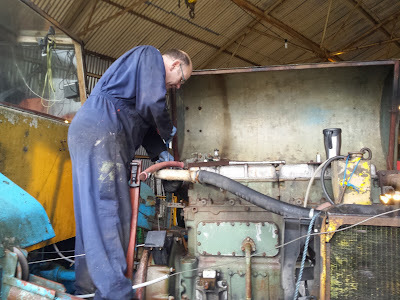 Rick wprking on the Gus Launch engine. The hangar was busy with Rick, Mike and David working on the GusLaunch winch which seems to be getting replacement cylinder head gaskets, and the small tractor which now has a working alternator. Good stuff. One event seems to have been missed in previous blogs is the loan of his own K8 by Bob Sansom to the club for members to use while the club K8 undergoes some refurbishment. This glider is now rigged and in the hangar ready for use as soon as we get a break in the weather. We are waiting patiently for the weather to improve.